By savalakhsingh, December 31, 2018 in WHAT'S HAPPENING? What is everyone's new years resolutions? To do with sikhi or not, let me know! 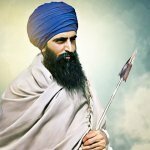 I watched the video above and Giani Pinderpal Singh ji said that if you do 4 Angs of Paath a day of Sri Guru Granth Sahib ji Maharaj, you finish all of it in a year. Try and do 2.5 hours of Simran alone in my bedroom. Go To Topic Listing WHAT'S HAPPENING?